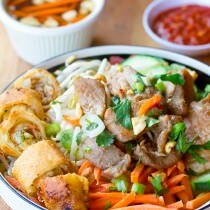 Fresh and crunchy Vietnamese Bun Cha Gio Salad Bowl Recipe, my all-time favorite classic Vietnamese dish. In college, one of my dearest friends and I, often scheduled lunch dates at our favorite Vietnamese restaurant. One day, we entered the restaurant and were intercepted by a young Vietnamese waiter who was still learning English. He led us to our table as we chatted and giggled away. The waiter, who seemed to show special interest in our dining experience, hovered over us, trying to make conversation. We felt a little embarrassed at the extra attention. Yes, even with broken English, he had game. Some things cross all cultural boundaries. The town I grew up in has a significant Vietnamese population with incredible little restaurants and vast Asian markets. Exploring the Asian markets is a feast for the eyes, especially the produce department and meat counter. 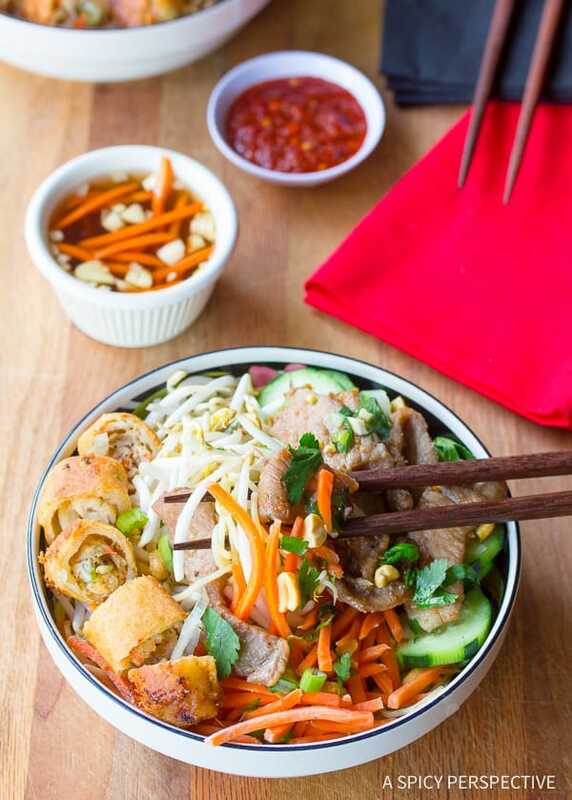 Vietnamese Bun Cha Gio is a traditional pork noodle salad, served in a bowl with fresh veggies and nuoc cham, an acidic dressing/dipping sauce. Nuoc Cham is normally made with sweetened lime juice and fish sauce, but I discovered that restaurants often make theirs with rice vinegar instead of lime. I find I actually prefer this method, as it cuts out a little of the “bite”. The nuoc cham is the only source of spicy heat in Vietnamese Bun Cha Gio, so add as much or as little as you want to the salad. You can also boost the heat by adding more chili-garlic sauce. Gio’ is the Vietnamese word for fried spring rolls. Hot, chopped spring rolls are added to the top of the salad for crunch. In order to speed up the prep time on this dish, I did not make our spring rolls from scratch. Instead I bought good-quality frozen spring rolls, oiled them and baked them in the oven. It provides the extra flavor and crunch without turning this meal into a 2 hour cooking affair. Bold and healthy Vietnamese Bun Cha Gio is something I crave on a regular basis. My kids are crazy over it, and I bet yours will be too! 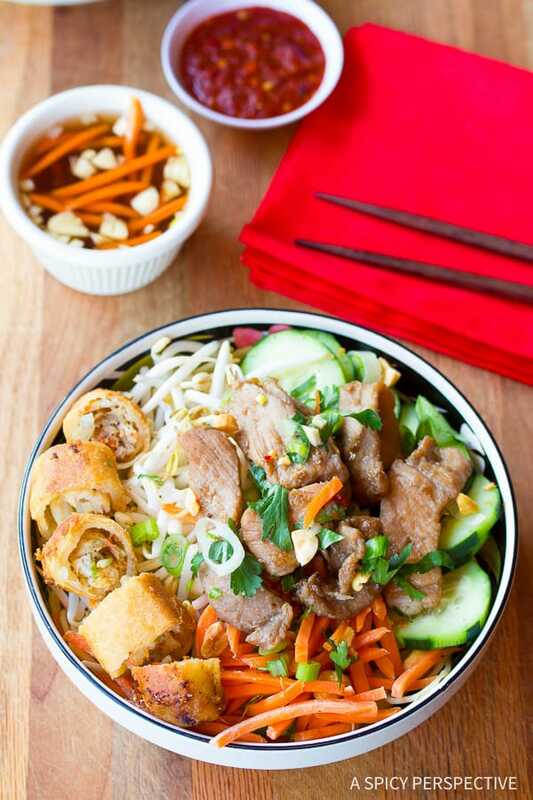 Fresh and crunchy Vietnamese Bun Cha Gio Salad Bowl, my all-time favorite classic Vietnamese dish. 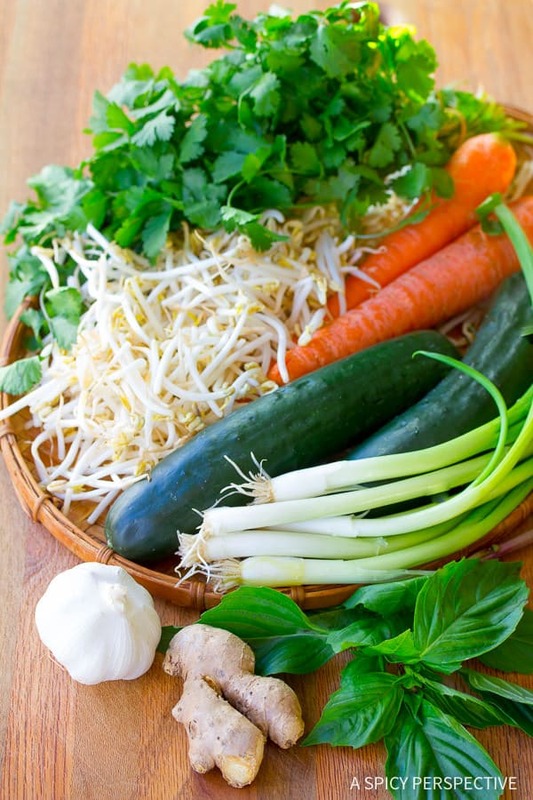 This healthy dish is loaded with noodles, vegetables and protein! Freeze the pork for 30 minutes to firm it up. Then cut each chop in half length-wise and thinly slice (1 mm). If already frozen, thaw half way before slicing. 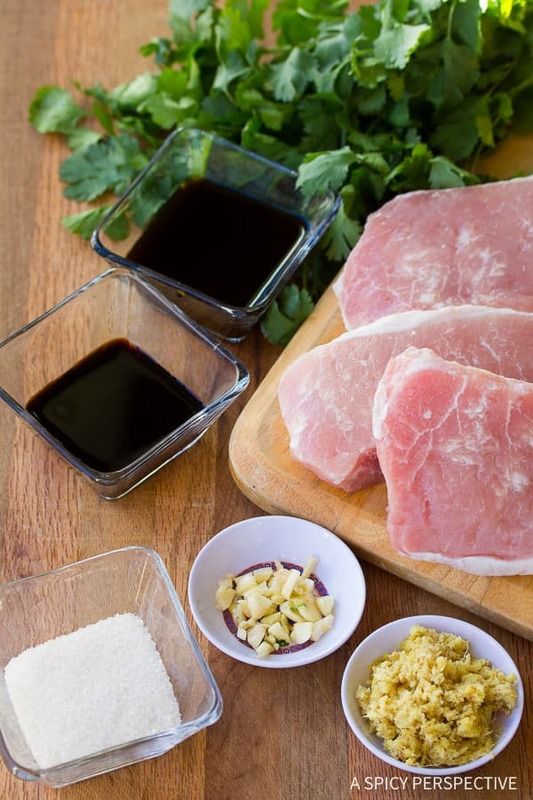 Mix the next five ingredients and toss with pork in a bowl. Allow the pork to marinate for 30 minutes. For the Nuoc Cham: Mix the warm water and sugar in a small bowl. Stir until the sugar in dissolved. Then add the following six ingredients and set aside the nuoc cham. Preheat the oven to the necessary temperature provided on the spring roll package. Drizzle a little oil on a cookie sheet and roll the frozen spring rolls in it. Cook the spring rolls according to the provided instructions. Heat a large wok or skillet to high heat. Drain the pork well. Add 1 tablespoon of peanut or vegetable oil to the wok. Stir fry the pork for 1-3 minutes. Chop the spring rolls into 1/2 inch pieces. 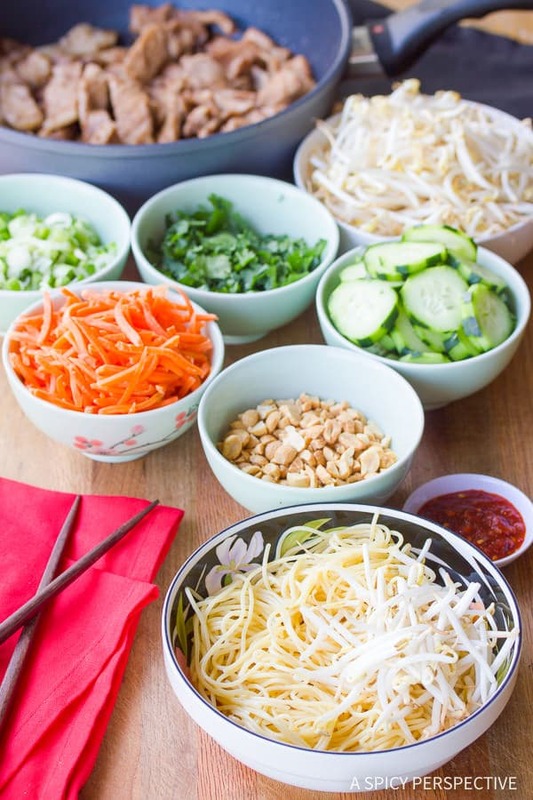 To plate: Place a large hand-full of noodles in the bottom of four bowls. 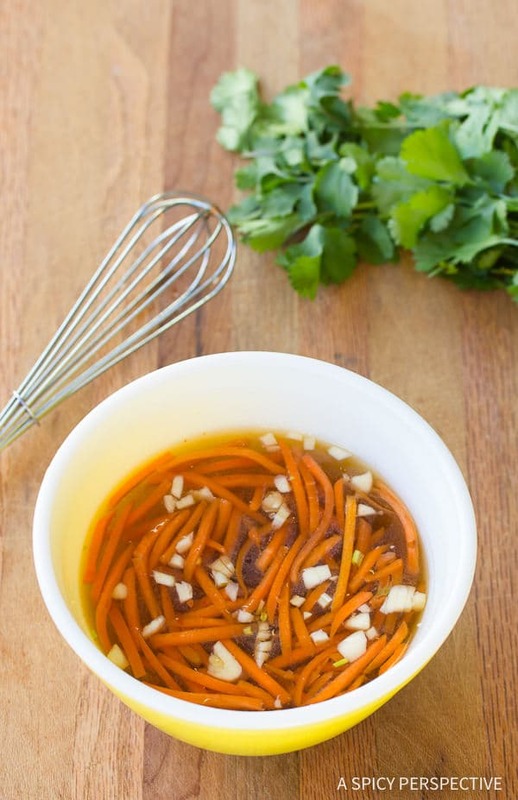 Top each with sprouts, shredded carrots, cucumbers, cilantro, and green onions. 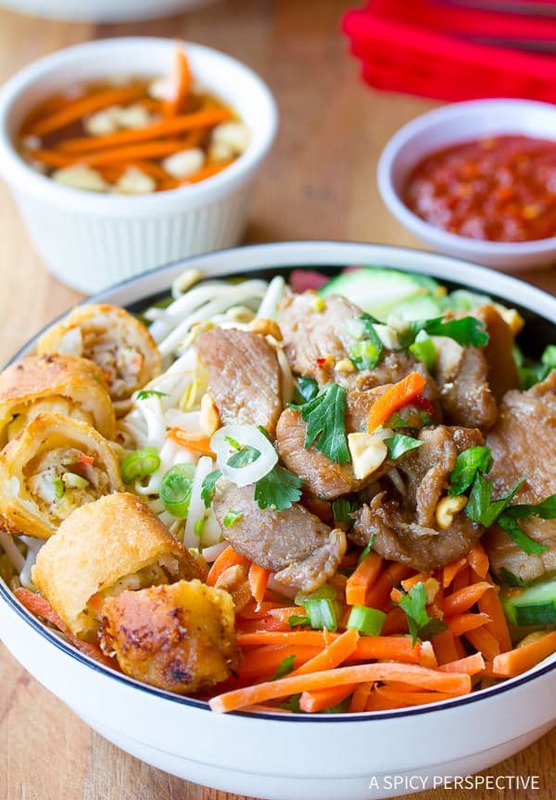 Place the pork and spring rolls on top, and sprinkle with chopped peanuts. 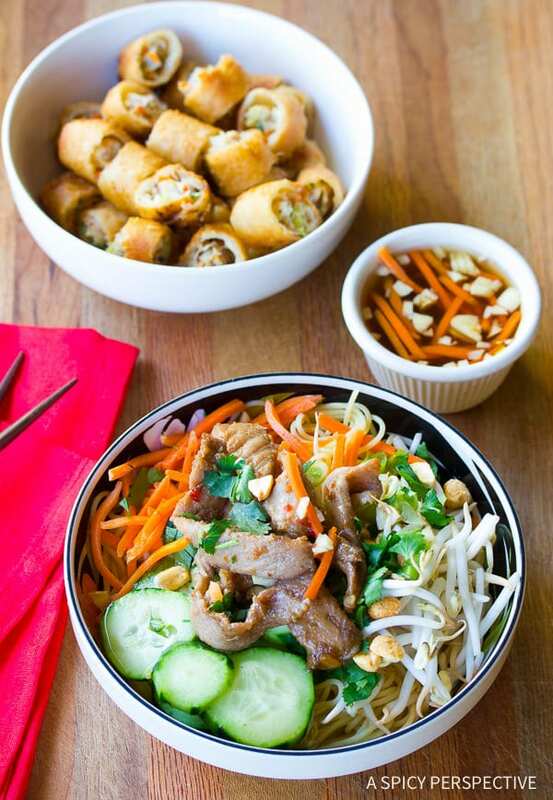 Serve with nuoc cham on the side, so each person can add as much as they desire!